A new devotional motif has emerged towards the end of the 20 th century, Christ as Divine Mercy, according to a 1931 vision of the Polish St. Maria Faustina Kowalska of the Most Blessed Sacrament (1905-38), sister of Our Lady of Mercy in Cracow. In the devotion to Divine Mercy a certain picture, the “ Divine Mercy Image”, plays a quite prominent role: it is a representation of Christ, bearing the wounds, pointing to the left side of his chest from which emanate a rosy and a white ray of light. Below, a scroll carries the Polish text “Jezu ufam tobie”, Jesus, I trust in you. 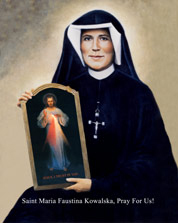 Jesus commissioned Saint Faustina to have that image painted of Him as He appeared to her in a vision. The rays represent the blood and water which flowed from His pierced side on the cross. The image was to be signed: “Jesus, I trust in You”. As nearly always, a vision appears in a familiar, contemporary form. Created in the 1930s, this particular painting reflects the pious imagery familiar to a devoted nun at that time, its ancestry probably to be found in the Sacred Heart pictures of the early decades of the 20 th century. 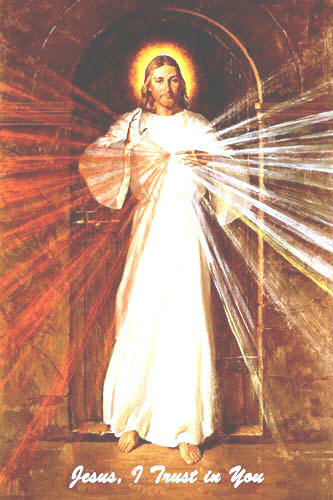 Sr. Faustina relates the vision in her diary: “In the evening, when I was in my cell, I became aware of the Lord Jesus clothed in a white garment. One hand was raised in blessing, the other was touching the garment at the breast. 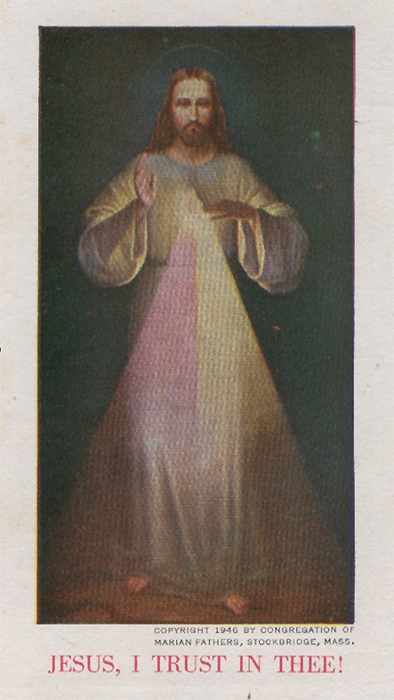 From the opening of the garment at the breast there came forth two large rays, one red and the other pale. In silence I gazed intently at the Lord; my soul was overwhelmed with fear, but also with great joy. After a while Jesus said to me, ‘paint an image according to the pattern you see, with the inscription: Jesus, I trust in You’”. In later entries Jesus explains or comments on the picture and its veneration (48, 299, 313, 327, 341, 570, 742). In 1934 and under the instructions of Sr. Faustina the vision was painted by the Polish painter Eugene Kazimierowski in Vilnius, Lithuania, then part of Poland, and in 1935 his painting was publicly venerated for the first time. Two years later it was placed in St. Michael’s church of that city. 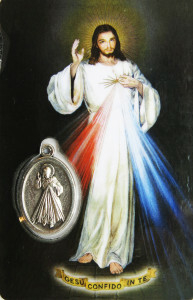 Thus, the “Vilnius-type” may be regarded as the prototype of the Divine Mercy Image. Today the painting is venerated in the church of the Holy Spirit in Vilnius. However, perhaps even more popular is another variant, the so-called “Hyla”, painted in 1943 by another Polish painter, Adolf Hyla and placed in the 1891 monastery church. This painting was the favourite of John Paul II. Today the near life size painting is to be found in the new sanctuary of Divine Mercy in Cracow, Poland, Sanktuarium Bożego Miłosierdzia , Krakow-Lagiewniki , consecrated in 2002, where Sr. Faustina herself lies buried. This obviously adds to the prominence of that particular variant. A photo of the Vilnius-painting was brought to the United States of America in 1941 by a Polish priest escaping Nazi-occupied Poland. Already in 1944 the Divine Mercy Image in Eden Hill, Stockbridge, Massachusetts, became quite popular, and in 1960 a shrine for the devotion was solemnly dedicated. Since then a huge quantity of reproductions and holy cards has spread various types of the image to all corner of the Catholic world. They all keep the main features of the prototype, representing the vision somewhat differently, as seen in the painting by the american artist Robert Skemp (1910-84) from the 1970s. In 1934 and under the instructions of Sr. Faustina the vision was painted by the Polish painter Eugene Kazimierowski in Vilnius, Lithuania, then part of Poland, and in 1935 his painting was publicly venerated for the first time. Two years later it was placed in St. Michael’s church of that city. 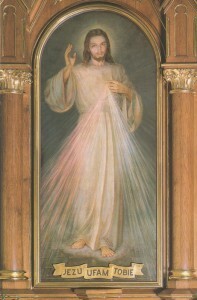 Thus, the “Vilnius-type” may be regarded as the prototype of the Divine Mercy Image. Today the painting is venerated in the church of the Holy Spirit in Vilnius. However, a variant was painted in 1943 by another Polish painter, Adolf Hyla, and placed in the monastery church. This painting was the favourite of St. John Paul II. Today the near life size painting is to be found in the new sanctuary of Divine Mercy in Cracow, Poland, Sanktuarium Miłosierdzia Bożego, Krakow-Lagiewniki , consecrated in 2002, where Sr. Faustina herself lies buried. This obviously adds to the prominence of that particular variant. Today, the Hyla-painting has become synonymous with the Divine Mercy motif, reproduced innumerable times. The introductory vignette shows a typical devotional item, a standard sized laminated prayer card, produced by LAL in Loreto, Italy, with a small oval medal of the Hyla painting.